Guests choose from four different color stamper photo favors; blue, light blue,orange and green. Party guests have the option to create photo favors with their images or photo favors with their images and a custom message. Multiple guests can play at once and can create the same photo favor. Guests will receive their own stamper photo favor and each party guest can have their own own color of stamper. Stamper photo favors have their own box where it can be stored during the event. An attendant is present at all times during the course of the event. Contact an Event Entertainment Specialist at 800-WOW-1196 or 732-846-8300 to discuss if the Photo Stamp Booth is the appropriate choice for your birthday party or religious event. 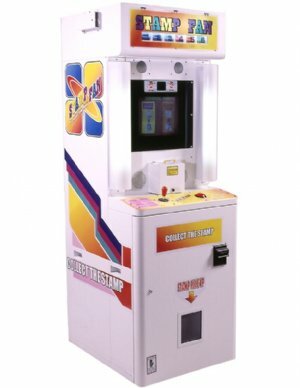 The Photo Stamp Booth produces unique photo favors and is used primarily at events such as bar & bat mitzvahs and birthday parties. This is not a traditional photo booth as there is not an enclosed area where party guests sit down to participate in the photo stamp booth experience. There is a curtain that is attached to the front of the booth that does act as a backdrop and like a traditional photo booth the photo stamp booth has all of its components contained inside the booth. The photo stamp booth dispenses different color stampers as photo favors with the party guests' images imprinted on them. The photo favors that the photo stamp booth produce came to the attention of our event entertainment specialists at an international trade show. It was quickly determined that the photo favors would appeal to bar & bat mitzvah party favor clients as well as birthday clients with guests of honor celebrating birthdays between the ages of six of fourteen years old. Unlike other photo favor experiences, the photo stamp booth was interactive and allowed for customization by the party guests themselves. 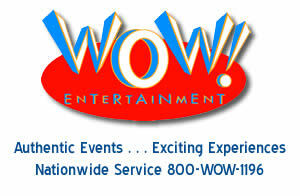 With its interactivity and the cool photo favors that it produces, WOW Entertainment made the decision to become the exclusive event entertainment production company in the United States providing this service. Party guests approaching the photo stamp booth are greeted by an attendant who will direct them to choose a different color stamp which will become their custom photo favors. Once a decision has been made, the attendant navigates the control panel and instructs the the photo stamp booth to dispense that color stamper photo favor. Once dispensed the individual stamper photo favor is removed from a box and is placed in an imprinting mechanism located in the front of the booth. The attendant carefully places the stamper photo favor into the mechanism and then the mechanism retracts into the booth. At this point, party guests are prompted to choose from two different features in order to create their custom photo favors; to have their images imprinted on different backgrounds or to have their images imprinted on different backgrounds along with the ability to create a message. Once the decision has been made the photo stamp booth takes a series of several pictures. At the conclusion of the image taking, party guests have the option of choosing which image they prefer to appear on their stamper photo favor. If the guests have chosen the image with a message, then the guests are instructed by the attendant on how to create their message with the control panel. In either case, at the conclusion of this interactive experience the stamper photo favor is delivered within twenty seconds. The attendant will remove it from the imprinting mechanism, create one stamp for the guests to view and then place it back into the photo favor box.